Panasonic introduced the Toughpad FZ-A1, the company's first professional-grade Android tablet. This 7" tablet is expected to ship in the second half of 2012, it features Android 3.2, a Marvell 1.2GHz dual-core processor, 16GB storage, MicroSD support (up to 32GB), 1GB SDRAM, a 10.1" XGA screen with 500 nits brightness, capacitive multi-touch and anti-reflective coating, a 5MP rear camera, 2MP front camera, 3G, 802.11a/b/g/n WiFi, Bluetooth 2.1+EDR, satellite GPS, and a battery life of up to 10 hours. Panasonic Computer Products Europe, the continent’s leader in rugged mobile computing, today unveiled the Toughpad FZ-A1, the first in its Toughpad® family of professional-grade Android™-powered tablets. The 10-inch Toughpad FZ-A1 is ideal for highly mobile outdoor workers in challenging conditions like aviation, construction, field service and public safety. The range will be supported by an eco-system that includes a wide range of work accessories, such as vehicle mounting and ergonomic hands-free holsters. Panasonic and its partners can also provide professional services such as project management, imaging and kitting. Panasonic will add a 7” tablet to the Toughpad range in the second half of 2012. “Consumers have enjoyed tablet computing for a number of years now with almost no uptake in the workplace due to fundamental design limitations. Now users in business and industry can also benefit from the ease of use and portability of tablet computing. Toughpad takes all the Toughbook experience of rugged computing we have gained since 1996 and focuses it into tablets designed for the workplace.” said Hiroaki Sakamoto, Managing Director, Panasonic Computer Products Europe. Panasonic Toughpads have been designed from day one as a range of professional working devices. They are very different to consumer tablets. The new Toughpad family is designed to meet the same durability standards as Panasonic’s Toughbook laptop product line. The Toughpad FZ-A1 has a MIL-STD-810G rating for 120cm drops as well as an IP65 ingress protection rating for resistance to dust and water. 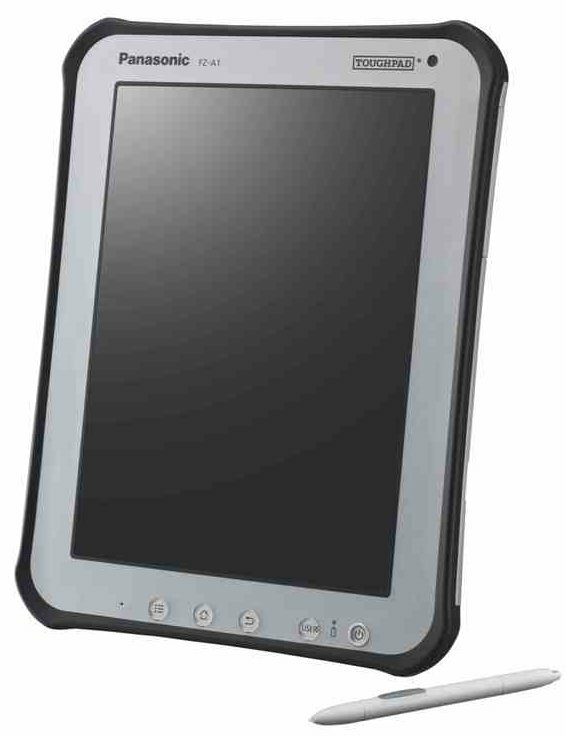 The Toughpad FZ-A1 is also rated for use in extreme temperatures. This allows it to be used reliably in almost any situation. The CPU in the Toughpad FZ-A1 incorporates a dedicated, tamper-proof, security processor, which frees up the multi-purpose CPU core for other tasks. The security CPU core handles software and data encryption, enhanced VPN, authentication, trusted boot and device management. This enhanced level of device security means the System on a Chip family of Toughpads will be compliant with FIPS 140-2 level 2. The Toughpad FZ-A1 offers as standard Bluetooth® v2.1 + EDR, 802.11a/b/g/n Wi-Fi, GPS and optional 3G mobile broadband offering up to 21Mb/s download speeds. The Toughpad FZ-A1 has a high brightness, 10.1” XGA, capacitive multi-touch, daylight-viewable screen with an anti-glare coating. Mobile workers, in markets like supply chain logistics, utilities and the military, can easily see critical data and operate the device even in daylight. The Toughpad FZ-A1 includes an active digitizer that records pressure, direction and speed along with the signature, so the signing of a document has greater legal authority. The digitiser pen is also battery-free reducing device maintenance and TCO. The Toughpad FZ-A1 offers 10 hour all day working. The battery is replaceable ensuring mid-life battery upgrades (Panasonic recommends the battery is changed by the IT support team). Ergonomic holsters and bags for one-handed, all day use. Multi-rack chargers, so many Toughpads can be simultaneously charged between shifts.